Camping in the Columbia Valley. 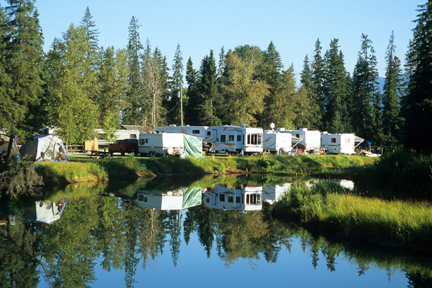 Campgrounds in the Columbia Valley are a mix of provincial parks and commercial facilities. Here are a few of our favourite camping spots, listed from north to south. Within Kootenay National Park, but accessed from in town off Highways 93/95, is Redstreak Campground (mid-May to mid-Oct., unserviced sites $27, hookups $35 to $39, fire permits $8 per site per night), which has 242 sites, showers, and kitchen shelters. A limited number of sites can be reserved through the Parks Canada Campground Reservation Service (877/737-3783, www.pccamping.ca). The closest commercial camping is at Canyon RV Resort (5012 Sinclair Creek Rd., 250/347-9564, www.canyonrv.com, Apr. to Oct., $36 to $46 per site), nestled in its own private valley immediately north of the Highway 93/95 junction. Treed sites are spread along both sides of a pleasant creek, and all facilities are provided, including a playground and laundry. Perfectly described by its name, Dry Gulch Provincial Park (250/422-3003, May to mid-Oct., $21) offers 26 sites four kilometers (2.5 miles) south of town. Typical of provincial park camping, each site has a picnic table and fire pit but no hookups. Reservations are not taken. Access to this popular British Columbia park is from Highway 93/95, 50 kilometers (31 miles) south of Radium Hot Springs and 28 kilometers (17.4 miles) north of Skookumchuck. From a signed turnoff, an unpaved logging road takes off east into the mountains, leading first to 1,994-hectare (4.930-acre) Whiteswan Lake Provincial Park, then to Top of the World Provincial Park. The road climbs steadily from the highway, entering Lussier Gorge after 11 kilometers (6.8 miles). Within the gorge, a steep trail leads down to Lussier Hot Springs. Two small pools have been constructed to contain the odorless hot (43°C/110°F) water as it bubbles out of the ground and flows into the Lussier River. Within the park itself, the road closely follows the southern shorelines of first Alces Lake, then the larger Whiteswan Lake. The two lakes attract abundant birdlife; loons, grebes, and herons are all common. They also attract anglers, who come for great rainbow trout fishing. Both lakes are stocked and have a daily quota of two fish per person. The main road skirts the lakes and passes four popular campgrounds. The sites are $17 per night and fill on a first-come, first-served basis. All sites come with a picnic table and fire grate. There are no hookups or showers. Kimberley Riverside Campground (250/427-2929, www.kimberleycampground.com, May to mid-Oct., $26 to $38) is seven kilometers (4.3 miles) south of downtown on Highway 95A and then three kilometers (1.9 miles) west along St. Mary’s River Road. It’s a large facility with an outdoor pool, a convenience store, a playground, and treed sites within walking distance of the river. Unlike the several backcountry parks in the area, 144-hectare (360-acre) Wasa Provincial Park, 30 kilometers (19 miles) north of Cranbrook, is easily accessible along Highway 93/95 north of Fort Steele. The lake is warm, making for good summer swimming. The park is divided into a number of different sections scattered around the lake, but all are linked by an eight-kilometer (five-mile) trail that encircles the lake. The main campground (519/826-6850 or 800/689-9025, www.discovercamping.ca, May to Sept., $28) is across the road from a small stretch of park beach and has hot showers.